In 2012 and 2013, when people were lining up at Smorgasburg and then on the second floor of the Houston Street Whole Foods Market for biodegradable bowls of Yuji Haraguchi’s mazemen — noodles that might be dressed with crisped twigs of bacon and a jiggling onsen egg, say, or yuzu-cured salmon and some Camembert soft enough to transform into a sauce — I was sure the crowds would multiply and fan out, demanding more of this strange brothless ramen. And they did, in a sense. 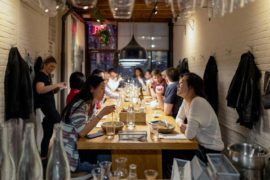 Soon Mr. Haraguchi had established his own free-standing establishment, Yuji Ramen in Williamsburg, Brooklyn, where he serves that bacon-and-egg mazemen along with his possibly visionary “tunakotsu” ramen. In 2014, when Ivan Orkin came to New York, he brought along his own mazemen recipes. Over the next few years mazemen turned up in other restaurants, too, but all of them remained better known for soup ramen, and sold more of it. It began to look as if mazemen would never be more than a sideshow act, the one-armed ax-catcher of the ramen circus. 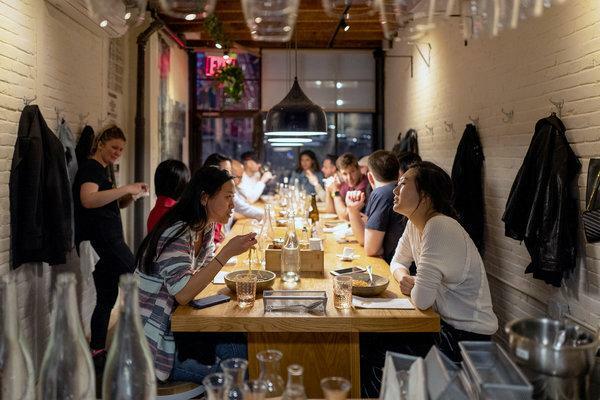 Then at the start of the year, the chef Shigetoshi Nakamura, who operates an intimate ramen shop on the Lower East Side, opened an annex next door that is dedicated to mazemen. All the seating at this new place, Niche, is at a dozen or so stools arranged around one long, narrow table. When the dining room is fully occupied, the only way to get from one end to the other is to walk sideways while holding your breath and picking up all the coats that you are going to knock off their wall pegs as you go. Not that there is much reason to roam around. Orders are taken from and delivered to the table, and there is no public restroom on the premises. As is the case next door at Nakamura, seats by the window offer a close-up view of the stone walls that support the last few yards of the Williamsburg Bridge before it empties onto Delancey Street. Before he came to New York, Mr. Nakamura was already well known in Tokyo, where he proved to have a theatrical streak. Before filling a bowl with noodles, he would yank them from the boiling water with his left hand and then hold them high in the air for a few seconds, letting them drain while standing completely motionless. Suddenly he would drop his arm and the basket would plunge toward the water again, before stopping just in time and getting one quick, emphatic shake. When Mr. Nakamura was immortalized as one of four “ramen gods” in a set of Hello Kitty notepads and phone straps, Kitty was posed with her left paw raised high in emulation of the Nakamura Shake. If Mr. Nakamura has been practicing his choreography on the spaghetti-like, crinkly noodles at Niche, I haven’t seen it yet. The Nakamura Shake seems designed to extract cooking water as quickly as possible before the noodles cool, and temperature is not especially critical in mazemen. The idea of noodle soup without the soup has been on the loose in Japan for decades. Broth is the most expensive and labor-intensive part of a bowl of ramen; in the 1950s, a Tokyo noodle shop, in the pitiless logic of the restaurant business, began omitting the broth when ladling out noodles at staff meals, or so the story goes. This “abura soba” — oil noodle, because it was moistened with lard along with the seasoning sauce called tare — wasn’t half bad, so it went on the menu at a discounted price. As an even cheaper version of an already cheap and filling meal, abura soba was quickly embraced, especially by students. As food ideas tend to do in Japan, it evolved rapidly. Today, abura soba tends to refer to dry soups that have more or less the same toppings you’d find in a bowl of normal ramen, while mazemen generally has toppings that are rarely seen in soup and often would not respond well to being submerged in hot liquid. There is Italian-style mazemen, with anchovies, salami, olives and tomatoes. Some mazemen shops specialize in fried beef cutlets. At a Tokyo restaurant called Beefst, the centerpiece of each bowl is sliced roast beef, served rare. Mr. Nakamura has an answer to that: steak mazemen. The steak is rib-eye, in cubes that have been browned with a kitchen torch. When you stir them with the noodles and a smooth, creamy spoonful of something the menu simply calls “pork sauce,” their juices and flecks of char flavor the whole bowl. Plain spinach and fermented bamboo, meanwhile, keep the total effect from being queasy-making. Novel, straightforward, refined, unruly and impure of heart, steak mazemen has the makings of a classic New York dish. So does the duck, a common special. A sliced breast of moulard duck cooked to a deep violet-pink, it is served with a bright, focused sauce built on soy and enough warm duck juices to lubricate the whole-wheat noodles. It is not an austere dish by any means, but it is balanced and restrained. The same cannot be said for another special that is always offered on the same nights: a bowl of liquefied foie gras topped with pistachios and truffle oil. It is not clear what will happen to anyone who tries to eat this with a spoon, but the prognosis does not seem good. Instead, everybody orders it with the duck mazemen and dips the noodles into the foie gras, after which conscious thought tends to stop for a minute or two. When cerebral activity resumes, you might wonder why the sauce doesn’t come with its own noodles. No other mazemen is such a joy ride, but the vaguely Italian one with tomatoes, mushrooms, kombu and an angry red soak of chile oil is not the kind of thing you want to turn your back on. Even the tribute to Russ & Daughters, where the noodles are coated with spicy cod roe and the topping is sliced smoked salmon, can sneak up on you. Niche is one of the few ramen-yas in town where the appetizers are worth noticing. Sea urchin perched on tiny corners of toast is a strange and awkward affair, but the sardines on toast, dressed with chile flakes, are very good, as are the raw scallops with yuzu juice and the avocado salad showered with puffed rice.